Vice Captain – Perth Wildcats, motivational speaker. 2018 West Australian of the Year Youth Award recipient. Vice-Captain of the 2013/14 and 2015/16/17 NBL Championship winning team the Perth Wildcats, Greg Hire is described as the workhorse of the NBL. Having begun his professional career with the Wanneroo Wolves, he progressed through the State Basketball League (SBL) ranks receiving the 2006 SBL Rookie of the Year award. Greg then headed to the US to begin a successful collegiate career at both Miles City Community College (MCC) and Augusta State University (ASU). Upon completion at Augusta State University, he returned to Perth and resumed playing duties with the Wanneroo Wolves before starting with the Perth Wildcats as a Development Player. In 2010, Greg made his NBL debut and the following year captained and starred in the SBL Championship where he took out the 2011 Grand Final MVP with 31 points and 28 rebounds. After signing a full contract with Perth Wildcats for the 2011-12 season, Greg shone, making 31 appearances and starring in Game 2 of the 11/12 Grand Final series with 12 points and 6 rebounds off the bench. Having re-signed with the Wildcats for the 2012-13 NBL season, Greg made his way into the starting line-up and after a strong season, was soon introduced into the leadership group. The season was topped off with an inclusion into the Boomers Training Camp, which was a testament to his high work ethic and ability to improve each year. 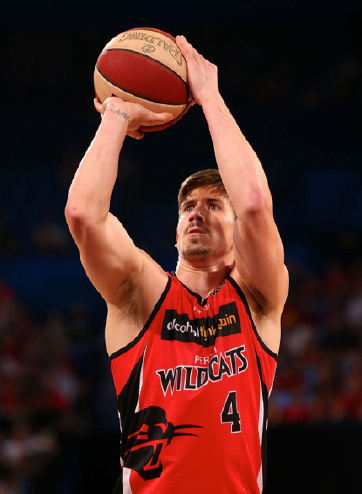 In 2013, Greg re-signed with the Wildcats on a three-year deal and was selected amongst his team mates to be Vice-Captain alongside Shawn Redhage. However it was 2014 where Greg shined – playing his 100th NBL game, being crowned NBL Champions of the Season, receiving Grand Final MVP voting recognition; and marrying his long term partner Ainsleigh Sanders. He played his 150th game for the team in February 2016 and was an integral member of their 2015/16/17 NBL Championship winning teams. Off the court, Greg works as an ambassador for Youth Focus, a charity which supports youth who are struggling with mental health issues. His passion – which stems from his upbringing and life experiences – recently saw him receive a Pride of Australia Medal nomination in the ‘Inspiration’ category, an award that he then won. In 2018 he was named as West Australian of the Year in the Youth Category for his work in the youth suicide prevention field. Greg has extensive leadership, mentoring, cultural change, public speaking, communication and presentation experiences that spans across sporting, business and cultural sectors. Greg’s success is the result of hard work, commitment and a relentless attitude; he is a very rare individual whose off the field accolades rival his on court accomplishments. Greg has the ability to impart his passionate message to any type of audience in an entertaining, stimulating, informative and refreshing style. His sense of humour will keep any audience amused, but his ability to share a powerful message has made him a much sought after speaker for corporate, government and sporting events. Through his work with Youth Focus, Greg has developed an education in the issues surrounding Mental Health; the passion in this issue is not lost in Greg’s philosophies. Leadership – What makes a good leader? Seeking Responsibility, Roles & Relationship, Build Trust, Build Confidence. Strategic Thinking and Dealing with High Pressure Situations. Gaining the Edge – Composure, Concentration, Confidence & Commitment. Andrew McMurdo, Workplace Health & Safety – Joondalup Health Campus.